About a year ago I wrote about a way to delete comments from tickets in Trac prior to version 0.12 (as it didn’t exist back then). Basically the method was to directly delete the comment from the database. Lately, spammers have been harassing one of my Trac installations, bypassing the spam filtering, and changing ticket properties. The old method wouldn’t revert those changes. 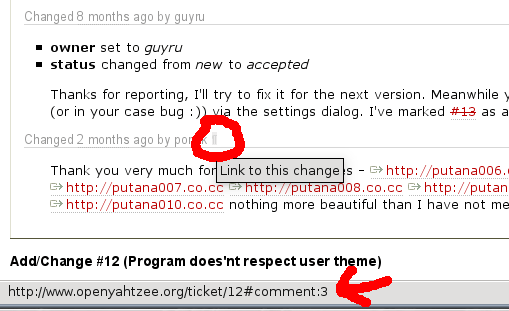 After searching for a solution, I found a little documented option in Trac 0.12 that allows to delete comments and revert changes to tickets. To enable it, go to the admin panel->Plugins->Trac 0.12 and enable TicketDeleter under tracopt.ticket.deleter.*. This will add a “Delete” button right next to the “Reply” and “Edit” buttons of every comment. It will also revert any changes to the ticket properties. See #3641 and  for the relevant ticket and changset in Trac’s own Trac. This entry was posted in Tips and tagged Trac on July 9, 2011 by Guy. Spammers apparently love Trac. After trying to fighting spam tickets and later installing the SpamFilter plugin, I’ve managed to control spam tickets in the Open Yahtzee Trac site.. But now spammers started spamming in the ticket comments. The bad news is that Trac (at least in version 0.11) doesn’t have built-in facilities to completely remove ticket comments. This entry was posted in Tips and tagged Trac on May 19, 2010 by Guy. I use Trac for the Open Yahtzee website. I’ve decided to use tracd for serving the requests (due to a configuration issue I didn’t want to mess with), which required starting it each time the server restarts. I’ve already written one solution for it, in the form of an init.d script for tracd. However, it bothered me that the tracd runs with root privileges which it doesn’t really requires. Just replace PORT, HOSTNAME and TRAC_ENV with the appropriate values for your environment, and make sure you got a run/ sub-directory in your home folder (or change the pidfile value). While there is no straight way to restart the server (like /etc/init.d/tracd restart), it’s a good compromise for dropping root privileges. This entry was posted in Linux, Tips and tagged Trac on February 17, 2009 by Guy. Recently the Open Yahtzee website which runs Trac has fallen victim to several spam attacks. The spammers submit large number of tickets containing links to various sites. This post was written mainly to allow me to copy paste a command to delete a range of tickets at once, but I thought it may be useful to others as well. This entry was posted in Tips and tagged Trac on January 8, 2009 by Guy. As part of a server move, I went on to reinstall Trac. I’ve tried to install it as FastCGI but I failed to configure the clean URLs properly. I got the clean URLs to work if the user access them, but Trac insisted on addeing trac.fcgi to the beginning of every link it generated. So I’ve decided to use the Trac standalone server, tracd. The next problem I faced was how to start the Trac automatically upon startup. The solution was to use an init.d script for stating Trac. After some searching, I didn’t find an init.d script for tracd that were satisfactory (mostly poorly written). So I went on an wrote my own init.d script for tracd. This entry was posted in Linux, Python, Tips, Uncategorized and tagged Trac on June 4, 2008 by Guy.